Yellow fish is a scheme to raise awareness about sources of water pollution and the quality of water in streams, rivers, lakes or ponds. Yellow fish are stenciled next to drains to remind people that what is put down a drain impacts aquatic life. Road and surface water drains are designed to allow rainwater to drain into the nearest waterbody, but these drains can be a large source of pollution with substances like engine oil, paint, detergents and litter being put down them. Once these pollutants enter a waterbody they can be incredibly harmful to fish and other organisms that live there. Led by the Environment Agency, once permission is obtained from the landowner (usually the local authority), local community groups receive a pack including a stencil and guidelines for raising awareness in the local community. These groups can be local conservation groups or school groups. This is a brilliant, active way of getting young people interested in conservation. The project can be shaped to suit the group, being equally suited as the foundation of a whole Key Stage or as a stand alone activity. Raising awareness within the community via leaflets and newsletters also Makes Yellow Fish fantastic for developing learning, thinking skills and citizenship awareness. Participant’s are encouraged to send in a feedback form. Skelton Primary School’s Eco Team is one of many schools that has been involved with the Yellow Fish Scheme. 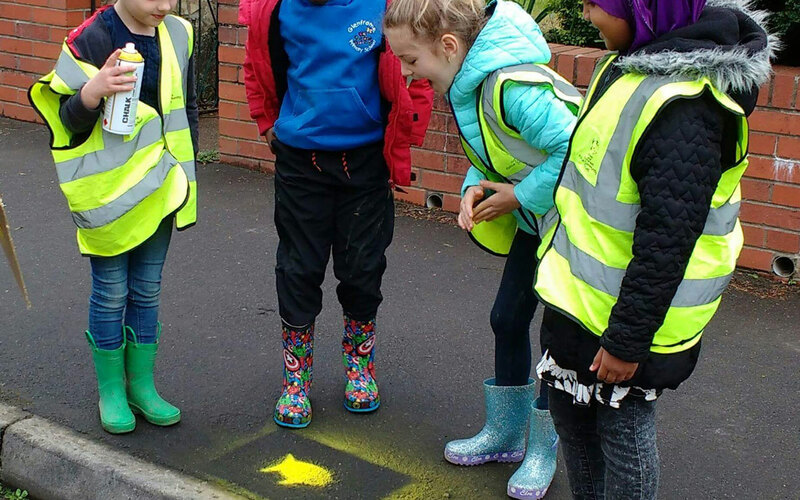 In conjunction with Tees Valley Wildlife Trust, the children spent an afternoon marking yellow fish next to drains. The children also went to the local river to see the possible effects of pollution. Jo Feary from Redcar and Cleveland Council also came along to explain to the children the work that had been done around the river by the council as well as local residents groups. As part of The Rivers Trust and Greggs Foundation Community Challenge Fund, Bristol Avon Rivers Trust took over 80 pupils from Bristol have been out running their own Yellowfish Project to educate members of their community on the link between storm drains and their river, the Bristol Frome. The Yellowfish initiative involves spraying yellow fish stencils onto the side of storm drains using non-toxic, washable paint and putting up posters and handing out leaflets to local businesses and houses in order to spread the often unknown message that storm drains at the side of the road run directly into the nearest river or stream. This means that whatever is poured down them, whether it is oil, litter or car shampoo, will pollute our waterways and kill fish and other wildlife!